Clarence Moore - passed away suddenly at his home in Shelburne Residence on Tuesday, November 27, 2018 at the age of 92. Beloved husband of the late Patricia Moore (Siddall). Loving father of Jo-Anne Maharaj (Vas), Cathy Moore Coburn (Rob), Kent Moore (Jennifer), and Ralph Moore. Cherished grandfather of Ryan (Kim Baker) and Gillian Maharaj, Emma (Stephen Hamelin) and Brett (Emmi Ott) Coburn, Jared and Rachel Moore, and Jessica, Thomas and Jasmine Moore. Brother of Alberta (Alta) Reid, and predeceased by sisters, Reta Priddle and Nelda Alcock. Clarence grew up and worked on his family’s potato farm in Badjeros for over 70 years until retiring with his wife, Pat in Shelburne. He found much pleasure in his work with the North Waterloo Farmers Mutual Insurance Company, serving on its Board of Directors for many years. In his younger years, Clarence was a skilled and avid athlete, excelling in hockey and baseball. 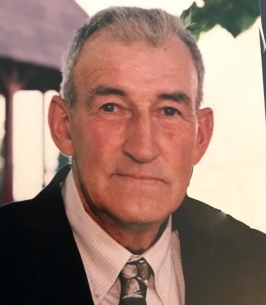 He will be fondly remembered for his outgoing personality and sense of humour, his entertaining stories and jokes, his love of nature, fishing, hunting and sports, the joy he found in all children, and his pride in his grandchildren. Friends and family will be received at the Jack & Thompson Funeral Home on Friday from 7-9 p.m. A memorial service will be held in the funeral home chapel on Saturday, December 1, 2018 at 10:00 a.m. Donations in Clarence’s memory may be made to Canadian Tire Jump Start Program or the Heart & Stroke Foundation. Jennifer and Kent, Saddened by your loss and sending you and your family heartfelt sympathy. Ralph and family and Cathy and Rob we send you our deepest condolences. We often reminisce about our trip to Alaska and the laughter created by your Dad’s jokes and stories during our travels. He was a fine gentleman. We were sorry to hear of your dad's passing. Donating to sports in his memory. My deepest condolences Cathy. My thoughts are with you in this time of sorrow.